When it comes to choosing who to build your new home then Chris O'Donovan Construction is the obvious choice. Chris O'Donovan has been building quality houses for the past 25 years. Been an initiative company Chris O'Donovan Construction use the latest building techniques delivering homes which achieve a BER A RATING. A-rated homes are the most energy efficient and will tend to have the lowest energy bills saving you money right from the day you move in. Chris O'Donovan Construction has been developing homes from site ground work to finish houses for many years. We arrive to a green field and are presented with the plans that will establish the type of home that will be built. We can then take on the role of project manager on your behalf and oversee all of the works that are required to make your dream plans become a reality. Throughout the project we will keep the various elements on the project on-track and on-budget to avoid over-runs. Our experience places us in a position to make suggestions from time to time on methods and layout options to enhance the functionality of your home and we remember at all times that this is your home. 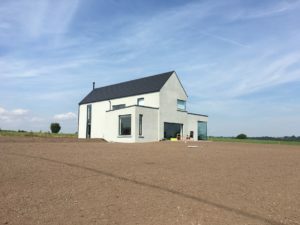 Chris O'Donovan Construction will liaise with your architect or consulting engineer and at all times keep open lines of communications back to our clients. This is vital in achieving a successful programme of works and avoids overruns and additional costs to the client.
" 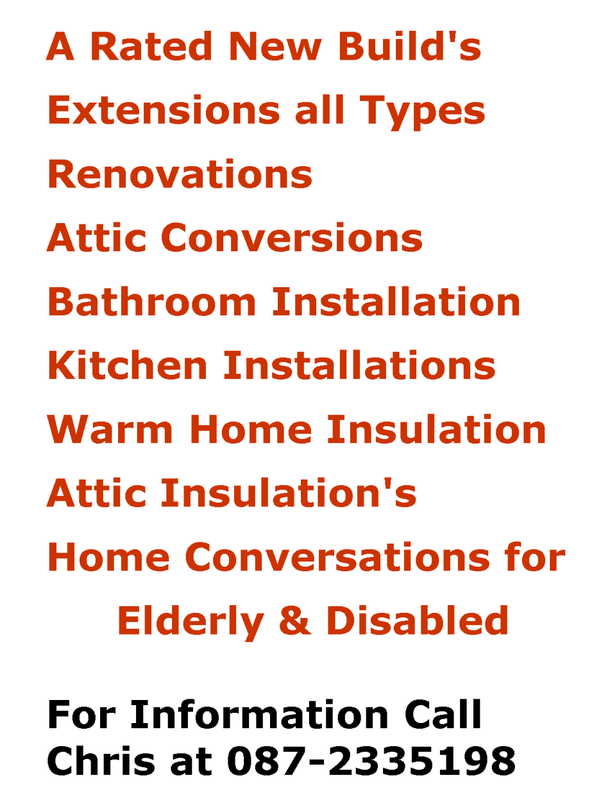 We Build Better Homes "
From Extensions to Renovations to New Builds. 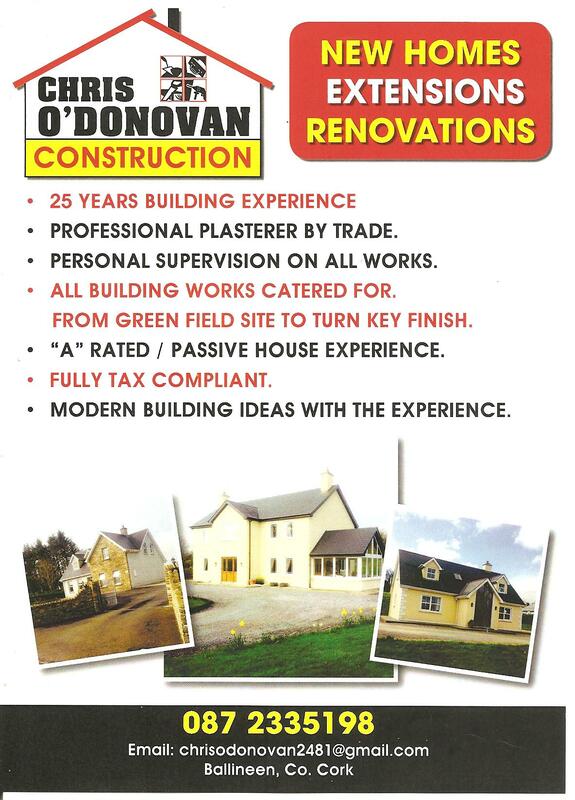 Chris O'Donovan Construction is a west Cork based building company with over 25 years experience in the building industry behind us. 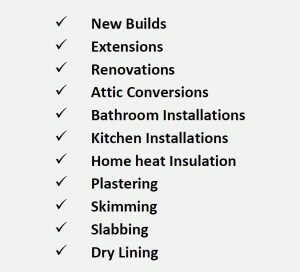 Chris O'Donovan Construction are specialist in building and plastering business that has built a reputation for delivering high quality building projects on time, with integrity and professionalism. 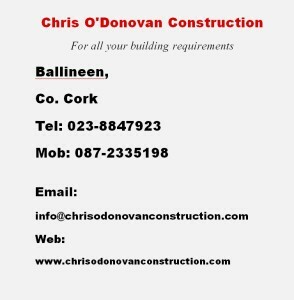 Located in Ballineen West Cork 20 miles from Cork city, Chris O'Donovan Construction provide service to the West Cork and beyond. We are a company which is fully insured, CIRI approved SIGA registered and C2 registered. 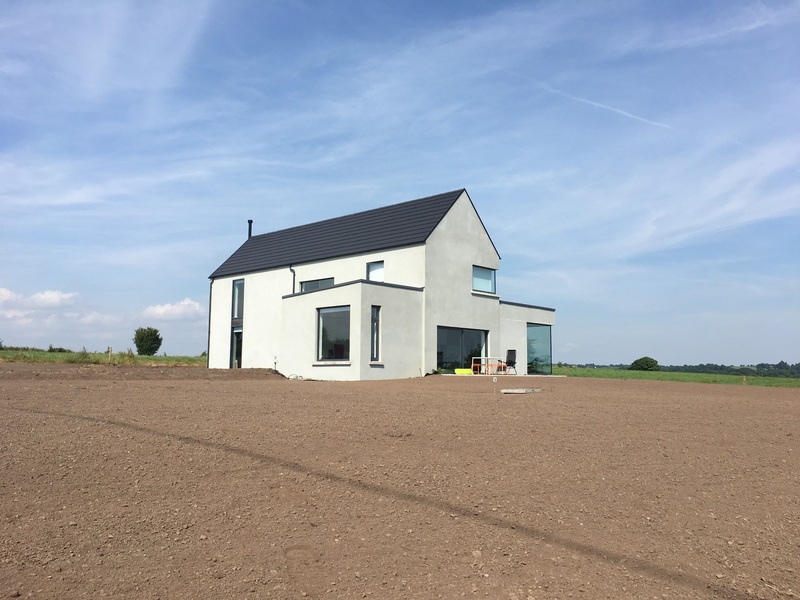 Chris O'Donovan Construction have extensive experience in new build projects, home extensions and renovation projects and are passionate about the quality of finish in all of our work. Chris O'Donovan Construction will assist you in developing your house and property to make it your dream home and will make the process as stress free as possible for you. Chris O'Donovan Construction only use the best qualified and experienced tradesmen. Quality and attention to detail is of paramount importance to us. We work closely with the home owners to provide complete customer satisfaction while always striving to bring our contracts to closure on budget and on schedule.